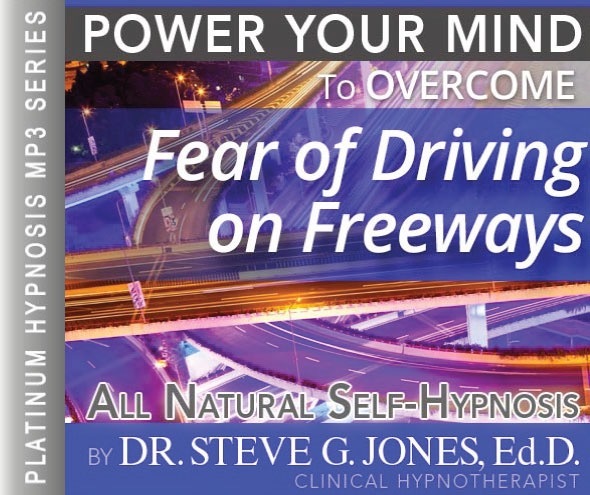 Learn How to Combat Your Phobia of Driving on Freeways with Hypnosis! You may be surprised to hear that fear of driving on Freeways is a fairly common phobia. Many people develop anxiety around driving on highways, over bridges, or just being in a car in general. You may find that you have become hyper-alert when in a car, to the extent that it actually makes driving more difficult. Because driving is essentially an unconscious activity (you don’t think about shifting gear, or pressing the brake), too much anxiety can interfere with the smooth operation of the car. 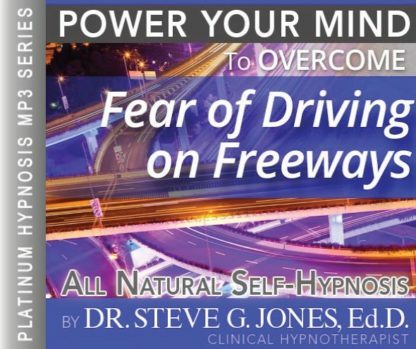 My Fear of Driving on Freeways Hypnosis MP3 can help! When this happens, people often start to doubt their ability to drive, further increasing anxiety levels. My Fear of Driving on Freeways Hypnosis MP3 session will help retrain your mind to relax when at the wheel while retaining a safe level of focus. You are a much safer driver when you are relaxed than when you are stressed, as you probably know. Steve G. Jones created a self hypnosis program called “Fear of Driving on Freeways Hypnosis MP3.” As a clinical hypnotherapist, Jones is able to create a calm feeling when entering the freeway. It is learned and developed prior to facing the experience and then carried through while driving. Steve G. Jones, Ed.D., Clinical Hypnotherapist, charges $1,500 for a custom recording and $25,000 for a one-hour private hypnotherapy session at his office. But you can get all the benefits for this low price. Simply listen to the Fear of Driving on Freeways Hypnosis MP3 download every night as you go to bed for three weeks and feel the changes happening in your life. You will feel more empowered, more in touch with your true self, and you will truly know that your goals are within your reach. Steve G. Jones achieves AMAZING and LASTING results!!! Hypnosis is the easiest way to affect change in your life because the positive messages go straight to your subconscious mind effortlessly so you can accomplish your goals and reach for the stars!! All you have to do is listen to the Fear of Driving on Freeways Hypnosis MP3 audio at night as you go to sleep!!! You’ll hear soft music, the gentle sounds of the beach, and the soothing sound of Steve G. Jones’ voice all working together to bring about positive changes in your life easily and naturally. Steve G. Jones has been helping people improve their lives with hypnosis for over 17 years…now it’s time for him to help YOU… don’t wait, do it NOW !!! you’ll be glad you did. See you at the top! As you now relax deeper and deeper and more deeply relaxed, I would like you to imagine yourself in a movie theater, in the projection booth running the movie. I would also like you to imagine that there is another version of you in the front row watching the movie. And there is yet a third version of you in the movie itself starring in the movie. But right now I would like you to imagine yourself in that projection booth running the movie. Realize that from here you can stop the movie at anytime you choose. And the movie starring you shows you driving on the freeway, that’s right. And see how relaxed you are in the movie. You are smiling. You are focused. You are comfortable. You are happy. And now if you are comfortable with this I would like you to picture yourself being the you in the front row of the theater. And at anytime you choose, you can move your point of view back to the projection booth, but if you are comfortable, imagine yourself sitting in the front row of the theater watching yourself in the movie. See yourself driving onto a freeway, relaxed and comfortable and safe, that’s right. And if you are now comfortable with this you can now imagine yourself in the movie itself and realize that anytime you can move back to the front row of the theater or all the way up into the projection booth and you can even stop the movie if you choose, but if you are comfortable with this imagine yourself in the movie now, driving on the freeway relaxed and safe, calm and focused. Day by day as you do this exercise you realize that you will become more and more relaxed driving on the freeway so that very soon indeed you will be able to drive on the freeway and be very relaxed, that’s right. Because you practice in your mind driving on the freeway and you feel so relaxed as you practice. Therefore when you do drive on the freeway, you will be relaxed and very focused and calm. So relax now as you continue to imagine yourself driving on the freeway and just realize just how powerful your mind is. You are becoming more and more relaxed day by day with the idea of driving on the freeway because you are a very calm and powerful and focused person and that feels so good.